Update PowerSchool Bulletin of school events. 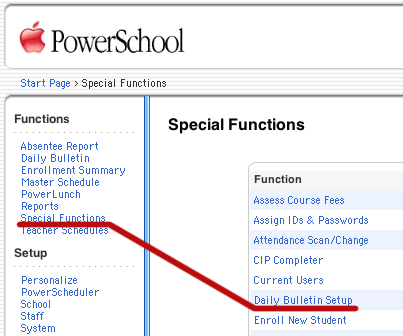 #1 Select Special Functions from the Main PowerSchool Menu then choose Daily Bulletin Setup. #2 Choose New to add a new Bulletin item. To edit an item click on the date link. #3 Fill in the blanks for the new Bulletin Item. 1 - This title show with the date for teachers and parents. 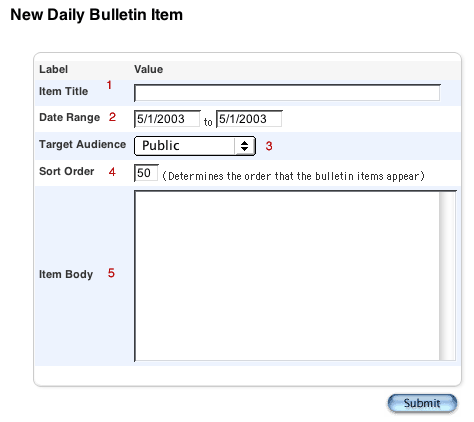 2 - The item will show on the bulletin for the specified period of time. 3 - Everyone can see Public items, Only teachers can see Teacher Items and Admin users Admin Items. 4 - Sort order lower first. 5 - The Item Body gives specific details for the item.